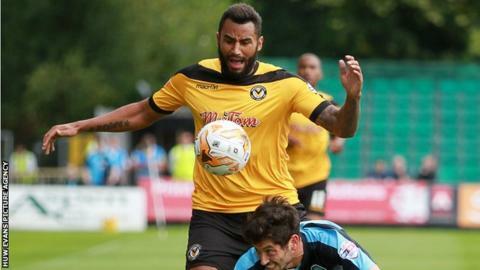 Newport County striker Rene Howe is expected to miss the rest of the season after rupturing his thigh muscle in training. Howe, 27, was not in the County squad who secured their first point of the season at home to Burton Albion. Manager Justin Edinburgh confirmed Howe will need surgery and that he does not expect him to feature again this term. "It looks like Rene's season is over which is a real big blow to us," Edinburgh said. "When we do get an injury we seem to get a major one so it's a huge disappointment for the lad and the football club. "He'll need surgery and once he's had that operation we'll know a little bit more. "It's going to be a fair while before Rene's back in action." Edinburgh also said that Howe's injury may force him into the transfer market for a replacement. Howe joined Newport County in January, 2014 following his release by Burton.